Representing Team Lakay, Jon Chris “Happy Feet” Corton, 26, of La Trinidad, Benguet, Philippines earned his first victory in Bahrain-based mixed martial arts promotion Brave Combat Federation. It marked his promotional debut, as well. Featuring 11 bouts, “Brave 16” took place at the Mubadala Arena in Abu Dhabi, United Arab Emirates on September 21, 2018. In the first bout of the evening, Corton competed in the flyweight division against Hussein “Iron” Ayyad, 24, of Manama, Bahrain. After three five-minute rounds, the flyweight bout between Corton and Ayyad was left to the hands of the judges. In the end, the referee raised the hand of the Filipino contender as the winner via unanimous decision. This is the first time Corton competed outside the Philippines. He made his professional MMA debut in 2012 and is now riding a three-bout winning streak. Winning at “Brave 16” improved Corton’s professional MMA record to 6 wins and 3 losses. On the other hand, Ayyad’s record downgraded to 1 win and 2 losses. The Philippines was one of the 16 countries represented at “Brave 16.” Among the three Filipino MMA fighters on the card, only Corton emerged victorious. “Brave 16” marked Ayyad’s second Brave CF bout. When he made his promotional debut at “Brave 12: KHK Legacy” on May 11, 2018, he defeated Jomar Pa-ac, 22, of Baguio City, Philippines. Like Corton, Pa-ac is also representing Team Lakay. Their teammate Crisanto “The Slugger” Pitpitunge, 31, of Kapangan, Benguet, Philippines was also on the “Brave 16” card. Pitpitunge and Hamza Kooheji, 25, of Bahrain competed in the bantamweight division in the fourth bout. The Bahraini contender won via unanimous decision. 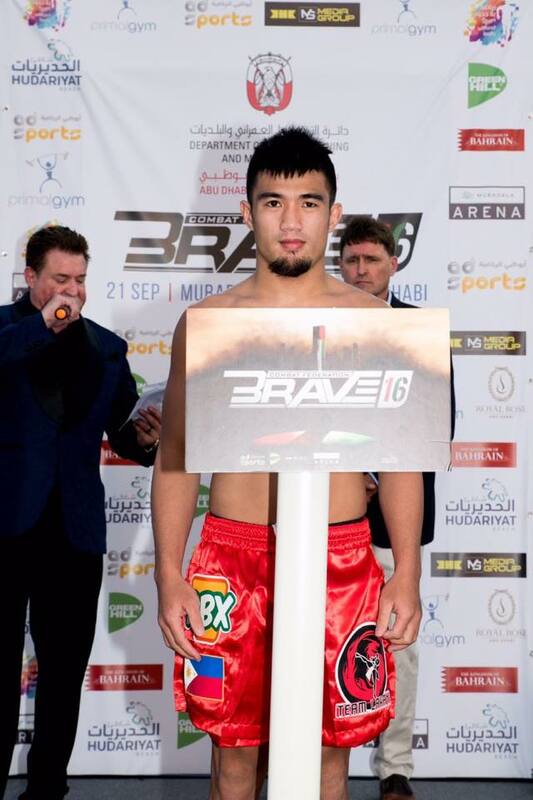 Three Filipino MMA fighters competed at “Brave 16.” Along with Corton and Pitpitunge, Vaughn “The Spawn” Donayre, 38, also represented the Philippines in the second Brave CF event to take place in Abu Dhabi. Fighting out of Cebu City, Philippines, Donayre competed against Flavio Serafin of Brazil in a catchweight bout. In the first round, the Brazilian contender submitted his Filipino opponent via armbar.